It’s a quiet week on comic shelves, and likely a quiet morning for most folks in the industry as hordes of Emerald City Comicon attendees recover from jet lag and hangovers. This Wednesday offers a bit more of a spotlight for indie releases like the Mama Cass biography California Dreamin’, Lorena Alvarez’ gorgeous comic/picture book Nightlights and Matt Kindt and Tyler Jenkins’ Grass Kings, with a few attractive collections and new-arc kickoffs to round us out. 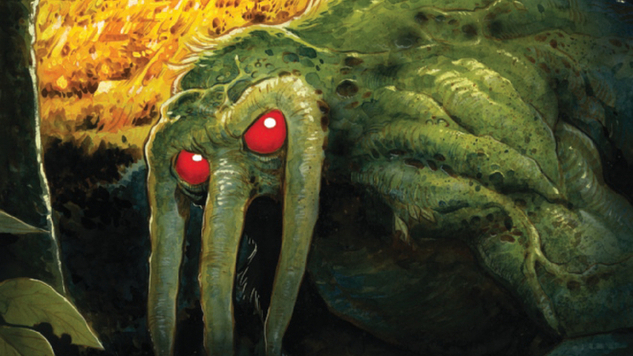 Marvel also sneaks in a Giant-Size surprise with the long-delayed debut of Goosebumps auteur R. L. Stine’s take on the menacing Man-Thing—which, it should be noted for maximum Hot Topic appeal, is available with a variant cover from Good Charlotte’s Billy Martin. Hey, we told you it was a quiet week.